Identity and Othering in "The Absolutely True Diary of a Part-Time Indian"
Home > Our Blogs > Facing Canada > Identity and Othering in "The Absolutely True Diary of a Part-Time Indian"
I’m not sure if it’s fate, or the fact that I’m a news junkie, but it seems as though I can always find a connection between what I’m studying in my classes and the news. This past term was no different. This text can also be used in the Facing History classroom as a tool for discussing identity. Junior finds himself in a peculiar situation where he seems to have “othered” himself – by choosing to leave the Spokane Reservation to pursue a better education at the high school in Reardan, a nearby white town, his community on the Reservation regards him as a traitor and his peers at his new school view him as an outsider. So that afternoon I called Jasmine in the Toronto Facing History office, and we came up with an effective lesson on the issues of identity and stereotyping, as they are explored by Junior in this text. First, we defined what a stereotype was, and students were asked to list the stereotypes people held about Junior, and those that Junior imposed on the people he met throughout the novel. 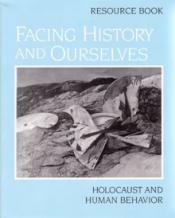 Next, we read Reading 1.4 titled “Stereotyping” in Holocaust and Human Behaviour (pp. 16-19). Students were then asked to list the stereotypes that the two witnesses in this reading had imposed on them, and the stereotypes they imposed on other people. Then, we watched Chimamanda Adichie’s TED Talk titled “The Danger of a Single Story”, and students listed the stereotypes that people had imposed on her, and those that she applied to people she had met and interacted with. Finally, it was time for some introspection. The next class, students received an image of an iceberg. On the small piece of the iceberg that was above the water, students listed aspects of their identity that could be seen by a stranger upon first meeting them. On the part of the iceberg image that was shown under water, students were required to write aspects of their identity that lie below the surface. The discussions that came after these exercises were very powerful. My students were able to relate to Junior and to other characters in the novel in an entirely new way. They were able to understand better where some of the prejudices of these characters were coming from, and also discover how some of their own prejudices affected their interactions with other people. They also understood the courage that Junior had to have in order to attend school at Reardan in a more meaningful way, and learned that sometimes you’ve got to make the unpopular decision when you’re trying to look after your own best interests. If you have used this novel in your classes, I’m interested in hearing how your students reacted to Junior’s choice to change schools, and his decision-making process. Were they more likely to empathize with him, or criticize his actions and motives? And did they see aspects of their own identities in Junior, or those of any other of Alexie’s characters? If you haven’t used this novel, but have used others which explore the same themes and ideas, how did you guide your students down their paths of self-discovery by using the novel as an anchor? Leah Mauer has been teaching with the TDSB for six and a half years. She currently teaches at City School, an alternative high school which focuses on social justice education. Leah teaches history, social studies, and English, and is an avid reader and chocoholic.